http://www.etsy.com/ Handmade crafts anyone? I've seriously been considering selling my own crafts here. I wonder how much I should charge? 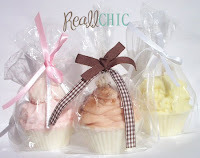 http://www.reallchic.com/ I really want to order the soaps and candles this company makes. I mean - when it looks so good you want to eat it - how can you resist? http://www.cocomyles.com/ This company makes bridesmaids/formal dresses. You choose the top and the bottom style, the fabric, the color, and a few additional things. (They have 4 tops styles with sleeves!) The prices are amazing. This is perfect for weddings with several bridesmaids because you can reserve fabric bolts so the fabric for all the dresses matches perfectly. The other fun thing is all the bridesmaids could choose their own style of dress but match the fabric. http://www.personalizationmall.com/ I love ordering things from this company. I have a canvas picture of my husband holding our son on his Blessing Day with a poem I wrote. Tons of people have asked where I got it - this is the site. It's a great way to personalize something.